Originally posted: August 26, 2017 . Last modified: April 12, 2019 . Don’t be caught off-guard for your next game day party. 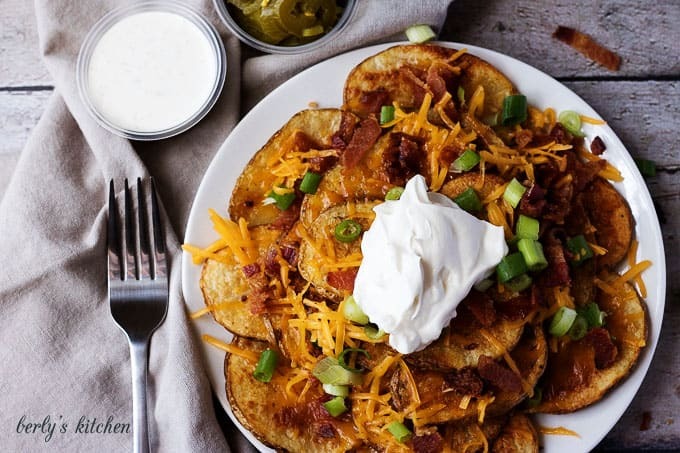 Bring along our oven baked loaded potato nachos piled high with melted cheese and a whole lot more! Much like Fall, game day season is just around the corner. As the temperatures drop, men and women suit up to face the elements and compete in some sports. For those of us who would rather watch than play along, we throw get together’s or parties. Nothing is more exciting than watching your favorite team while surrounded by great people and fantastic food. Like a loaded potato dish. Sometimes it’s hard to pick your favorite appetizer or snack. For me, it always comes down to fries or nachos. We decided to combine both of the dishes in today’s post. 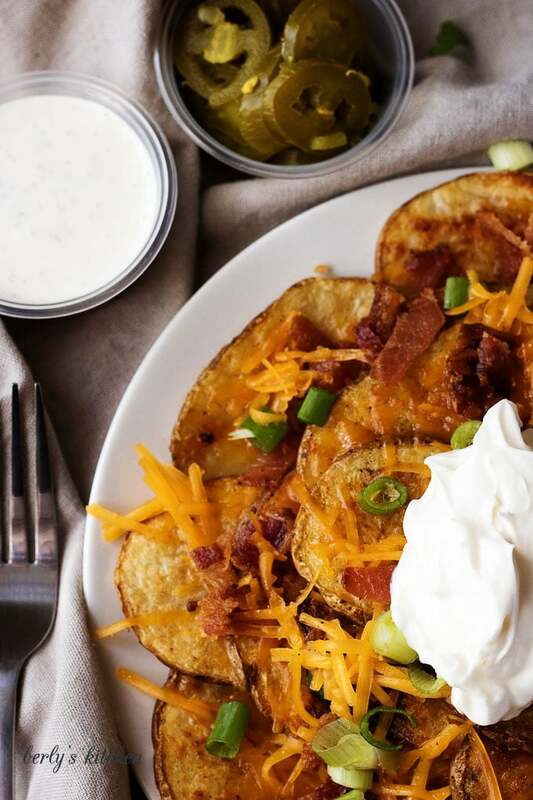 These oven baked loaded potato nachos have everything you love. Bacon, cheese, green onion, and sour cream adorn a plate piled with crisp baked chips. This offering can serve two to three people. However, if you’re making them for a crowd, just multiply the measurements by the number of guests. If you make a little extra, I promise, no one will complain. 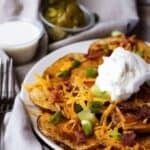 In regards to making the loaded potato nachos, I have a few tips, including a couple of words of caution. First, try to ensure you cut the taters the same width. The closer they are in width, the more evenly they will cook. Second, I would avoid using an expensive olive oil for this one. The only reason is that you’re not going to taste it once everything is smothered in righteous toppings. The last tip is to make sure all the chips are evenly coated with the oil and salt. Otherwise, you might notice subtle differences in texture and taste (from the missing salt). As you can see, it’s a pretty simple loaded potato dish to prepare. I encourage you to make it for your next game day party or just as an afternoon snack to be shared with a loved one. In closing, I wish everyone a long life, love everlasting, and a tummy full of fries and nachos! Here are a few of our other favorite appetizers. We thought you might like them, too! 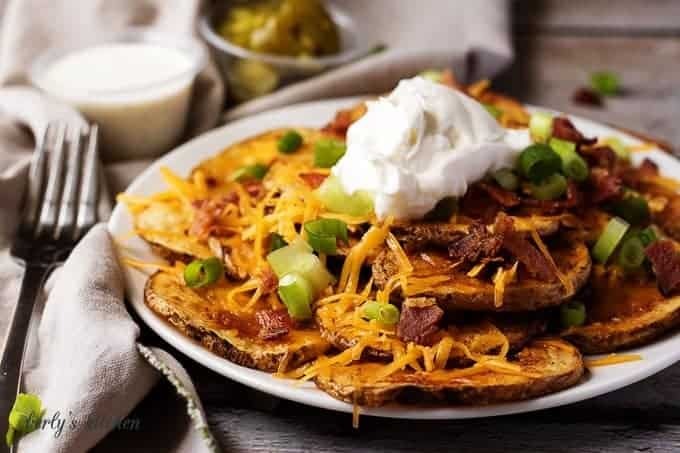 If you like this loaded potato nachos recipe, please leave us a comment and rate the recipe card. You can also find us on Facebook, Pinterest, Twitter and Instagram searching for Berly’s Kitchen! Don't be caught off-guard for your next game day party. 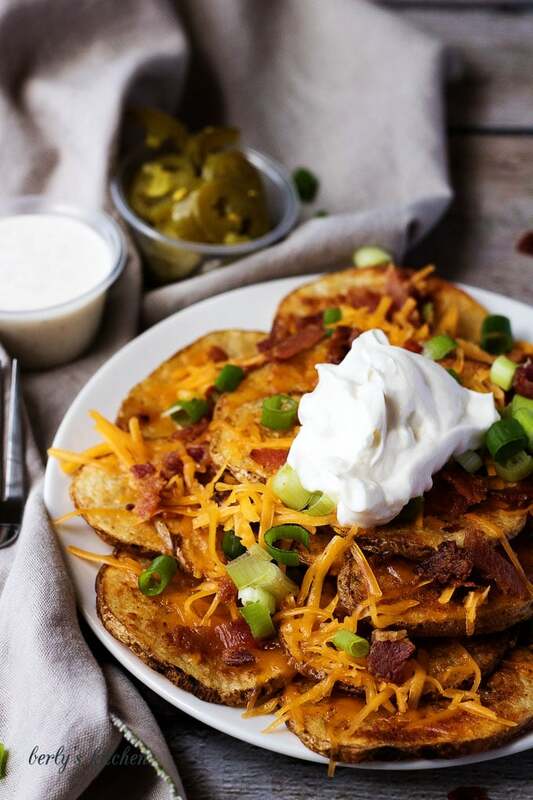 Bring along our oven baked loaded potato nachos piled high with melted cheese and a whole lot more! First, preheat your oven to 450 degrees F.
Next, evenly slice the potatoes into chips, making sure they are all the same thickness. Then, toss the chips with the olive oil and season salt and place them on a sheet to bake for approximately 30 minutes. Try to flip them halfway through the cooking process. As your taters bake, go ahead and cook your bacon and chop it into pieces. Additionally, slice your onions and shred your cheese. Last, layer the cooked chips on a plate and top them with the cheese, onions, bacon, and sour cream. Serve the dish while it's hot. The calories listed are based on the ingredients in the recipe. Actual calories may vary. Ingredients can be prepped in advance and stored in your fridge a few hours prior to cooking the potatoes. I would not recommend storing the finished product in your fridge because the dish will become soggy. OMG. These look really good. I love nachos, to begin with, but haven’t considered making them with potatoes! I will definitely be giving this a try. I’m not a jalapeno’s gal, but everything else looks delish. My son will love this as well! I’ve always wanted to try this but was never brave enough. I can cut and place potatoes in the oven for 30 minutes. That sounds easy enough and put the rest of the garnish on. You make it sound so easy but I guess I’ll have to find out when I make the attempt this weekend! Those turned out looking so good! 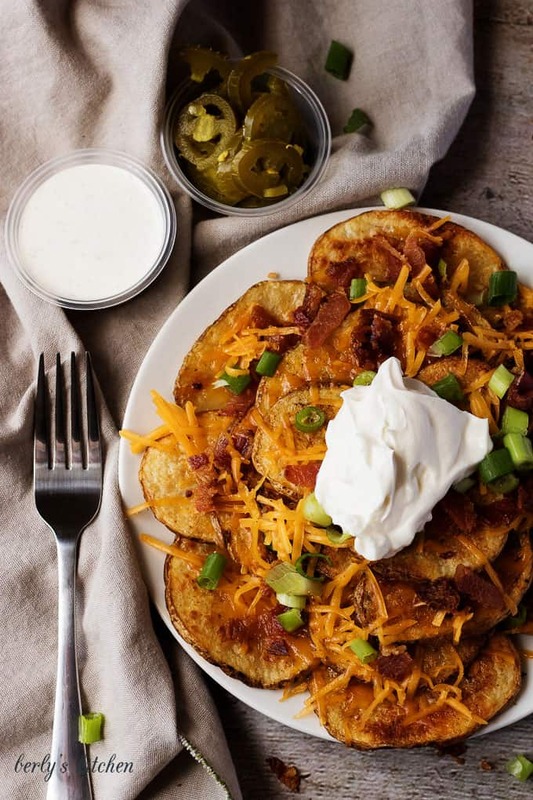 I think these oven baked loaded potato nachos would be perfect for a game day app or even a fun dinner with the kids. I think the kids would enjoy putting their own toppings on. What a yummy recipe idea. Thank you for sharing. That is a great way to use potatoes and they look delicious. They would be a great addition to any BBQ, I think I will be making this for the side I have to take this weekend to the Labor Day BBQ at my friend’s house. I would add guacamole too. WOW, this looks so delicious. Perfect snack for when my husband has his family and friends over for game day. My kids won’t eat potatoes, I’m wondering if I create this recipe if they would try them. They can be so picky at times! These look absolutely delicious! I really need a few new good weeknight recipes and this is one that I could put into the rotation. I love that you could add so many different toppings to these and they would still be delicious! Yum! Perfect game day grub. I would of never thought to use potatoes to make nachos. I’m new to your blog, so I can’t wait to poke around. I am definitely pinning this for fall. Those potato nachos look so delicious. I do not make them enough. They are the perfect appetizer for parties and football watching! The best thing about them is you can top them with almost anything.